The Fukien Tea is an evergreen tree named after the Southeastern Chinese province of Fukien (Fuijan) where it originates. It has small dark-green shiny leaves that are covered with hairs and forms a very dense, compact habit. It has a light brown bark that forms a cracked, fissured appearance with age. In early Summer the Fukien Tea produces minute white flowers that go on to form small black berries. In temperate regions the Fukien Tea is not hardy and are considered indoor trees for much of the year. 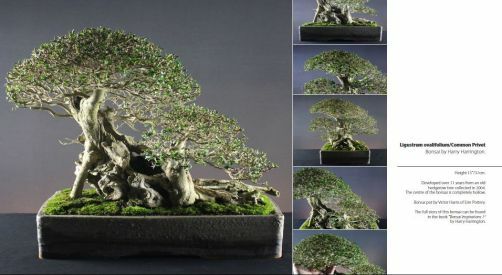 Though easily available at bonsai outlets, the Fukien Tea can be difficult to look after, particularly for beginners. POSITION Good light out of continual direct sunlight. Indoors, Fukien Teas need only 1 hour of full sun a day, outside give either direct morning or afternoon sun only. Carmonas must be kept in a temperature range of 15°C-25°C as much as possible. Should be placed outside during the hot summer months, the transition between indoors and outdoors should be made carefully. Carmonas must not be exposed to temperatures below 12°C on a continued basis and a bonsai greenhouse must be heated to this minimum temperature. A degree of natural light must be provided for the tree if overwintering in an outdoor garden shed or similar outbuildings. FEEDING Every two weeks from Spring to Autumn, monthly during Winter. REPOTTING Imported trees from China are usually potted in a clay that compacts very easily and this needs to be replaced by a basic soil mix. Repot every two years in Spring as growth commences. PRUNING Fukien Teas have a very dense habit and can be pruned to shape without the need for wiring. Hard pruning can be carried out at any time as long as the tree is healthy. PROPAGATION Sow seed outside as soon as ripe. Softwood cuttings in Summer. PESTS AND DISEASES Trouble free. Foliage that takes on a general yellowish colour is usually a result of overwatering and/or a poor draining compost. "Here in the dry tropics Fukien teas flower all year round. The presence of flowers and especially of seeds attracts ants, and concomitant scale and wooly aphid pests. Prevention is the best solution so our club recommends removing all buds unless the flowers are needed for a show. This is a tedious exercise with tweezers, but we have noticed the trees show overall benefit from removal, with better growth in trunks and branches. I usually groom off the largest leaf in a whorl at the same time."